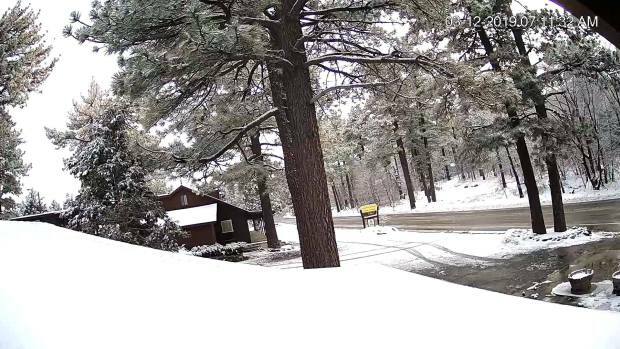 After a few dry and chilly days in San Diego, another dumping of snow hit San Diego's mountains while the rest of the county saw another round of rain Wednesday. A small storm system developed Wednesday morning in the Pacific Northwest before it quickly moved south towards San Diego County, NBC 7 Meteorologist Sheena Parveen said. The first sign of precipitation hit in the northern part of the county at about 1 p.m. Wednesday. As the system moved in, a winter storm warning for the mountains went into effect. The warning will last until 1 a.m. on Friday. Rain started off light and scattered before becoming more widespread in the evening hours. By 5 p.m. the county was experiencing spotty showers that NBC 7 Meteorologist Dagmar Midcap said would continue overnight. This bout of rain, Midcap said, won't be as heavy as last week's storms which were the products of an atmospheric river. The 48-hour total rainfall forecast tabbed inland and coastal areas between .10 and .33 inches while places like Julian and Pine Valley could end up seeing just over an inch. An approximately 75-foot tall tree set in soaked soil was pushed over Thursday night and blocked the entrance to a Girls and Boy Scouts club near the intersection of Upas Street and Vermont Street in Hillcrest. The facade of the building and some signs were severely damaged, but no one was injured. A caretaker who lives on the property said he has seen more than a half dozen trees fall near the building in the ten years he's lived there. While the rest of the county will see anywhere from a half-inch along the coast to an inch-and-a-half near the foothills, the mountains will be struck the hardest from this storm system. "The biggest issue will be in the mountains. Everywhere else will see some scattered showers," Parveen said. Eight to 16 inches of snow are possible on the mountain peaks above 5,000 feet, and snowfall levels could drop as low as 1,500 feet by Thursday morning. Families from Imperial Beach to Chicago were found frolicking in the Julian snow on Wednesday. One woman from Chicago said the temperature wasn't a problem for her because she escaped the Polar Vortex in the midwest that saw wind-chilled temperatures dip as low as negative 25 degrees. Caltrans said at around 6 p.m. Wednesday that chain control was in effect on State Route 79 between I-8 and the SR-79/SR-78 junction in Julian, and on Sunrise Highway between Highway 8 and SR-79. You can find more information on chain control here. A winter storm warning means severe winter weather conditions will make travel very hazardous or impossible in the mountains. The San Diego County Office of Education said campuses in the following school districts would be closed Thursday. Bad weather also forced the closure of SeaWorld San Diego on Thursday, the park said. The storm system will continue to pound San Diego with rain and snow through at least Thursday evening.